RG59 Siamese with Messenger is the choice for CCTV installations. Make your installations easier by carrying video (coax) and the option to power your equipment with the (2) 18 AWG power cables. The 95% Copper Clad Aluminum Braid protects the Video signal from external EMI and RFI. Carry Video from, and power to your Security Surveillance Camera with the (2) 18 AWG conductors. Same Solid Bare Copper (SBC) Center Conductor, but Pay less with 95% Copper Clad Aluminum Braid performance. 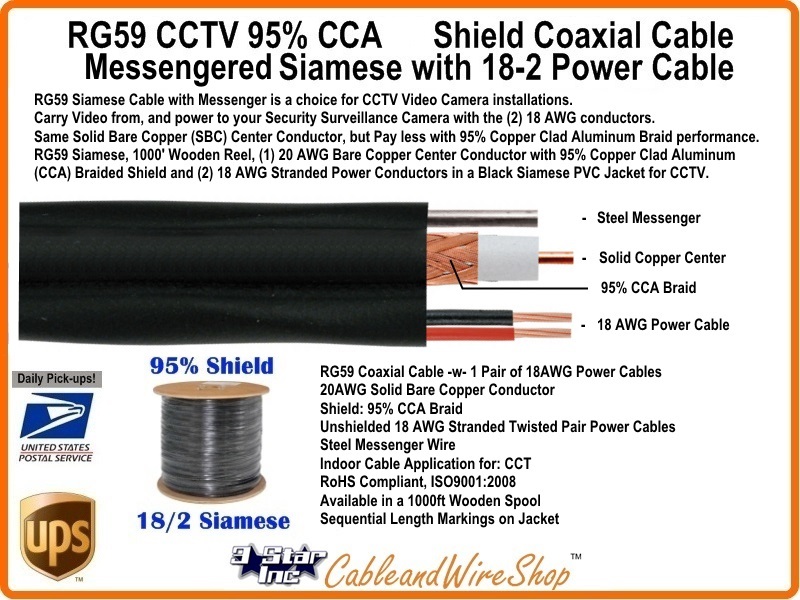 RG59 Siamese, 1000' Wooden Reel, (1) 20 AWG Bare Copper Center Conductor with 95% Copper Clad Aluminum (CCA) Braided Shield and (2) 18 AWG Stranded Power Conductors in a Black Siamese PVC Jacket for CCTV. Siamese cable refers to multiple cables being joined with a web joining the jackets integrally. There are siamese cables that are multiple count of the same type of cable or different. In Video Applications utilizing RG59, the siamese configuration is understood to include cable/wire for bringing power to the Camera and is sized/rated accordingly. The most common application uses 18 gauge, 2 conductors of wire (red and black) and has a comparable limit of length of use to the Coaxial Video Cable.